Hard drives have never been cheaper. A quick look at the offerings show that 250GB or more can be had for as little as £50. Coincidentally, we are beginning to adopt new high definition video formats that require a great deal more storage than the MPEG-2 standard, so 500GB is genuinely useful and will only become more so as we finally banish poor quality, lossy codecs to history. When lack of storage is a problem, instead of wedging the traditional internal drive into your fixed desktop PC, you could get many additional benefits by using an external box loaded with extra capacity. Fitting an internal hard disk can be a bit of an inconvenience - finding a spare SATA port, opening up your PC and ensuring there's room in your case is a chore you don't always need or want to endure. Buffalo isn't the first to market a half terabyte of portable storage with the Drivestation Duo, but what's on offer is quieter and cheaper than competing products. 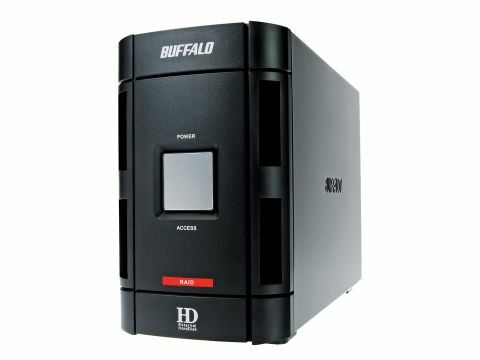 The box actually contains two 7,200rpm 250GB SATA drives, configured either as independent drives, a RAID 0 stripe or a RAID 1 mirror, and with a rear panel offering USB 2.0 and IEEE1394 connectivity in four- and six-pin varieties. The unit itself won't win any beauty contests. It has a few dim LEDs on the front to indicate power and disk activity, a rear fan, and not much else. Western Digital's MyBook Pro certainly makes a prettier desktop accessory, but beauty is only skin deep and under an ugly exterior hides excellent performance. Transfer speeds from individual drives were pretty good; our HD Tach benchmark reported a solid 23MB/s over USB, obviously faster when configured as a RAID stripe. An alternative to one of these off-the-shelf boxes is to purchase an empty external caddy, buy your own drives and make your own. But why bother? Manufacturers once charged a premium for external drives but that price difference has shrunk to the point where you only save a few pounds by going your own route, with no guarantee of decent build quality. Although the Drivestation is both heavy and ugly, its usefulness outshines all of that. It's a perfect way to increase your storage, it won't break the bank, and it's one less reason to open your PC.